At the time my dad, Graham Dawson, had been working for a local farmer called Harry Crabtree. His jobs included milking and delivering milk by horse and cart. According to the newspaper article my dad lived on the farm but at some point Mr Crabtree “decided he could dispense with his services” and he was just sacked. 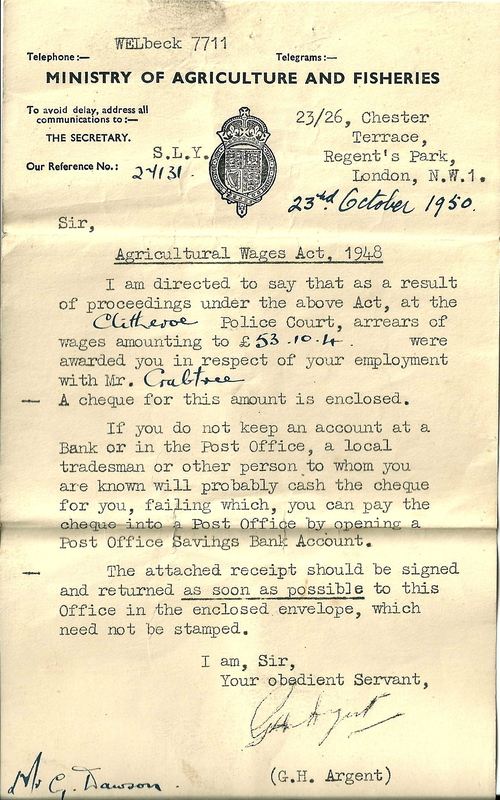 I’m not sure how things developed after that, but at some point the Ministry of Agriculture decided to prosecute Mr Crabtree under the Agricultural Wages Act 1948 for failing to pay the minimum rate of wages. There is a section missing from the bottom of the first column of the newspaper article but you can still get a good idea of what went on at the hearing. 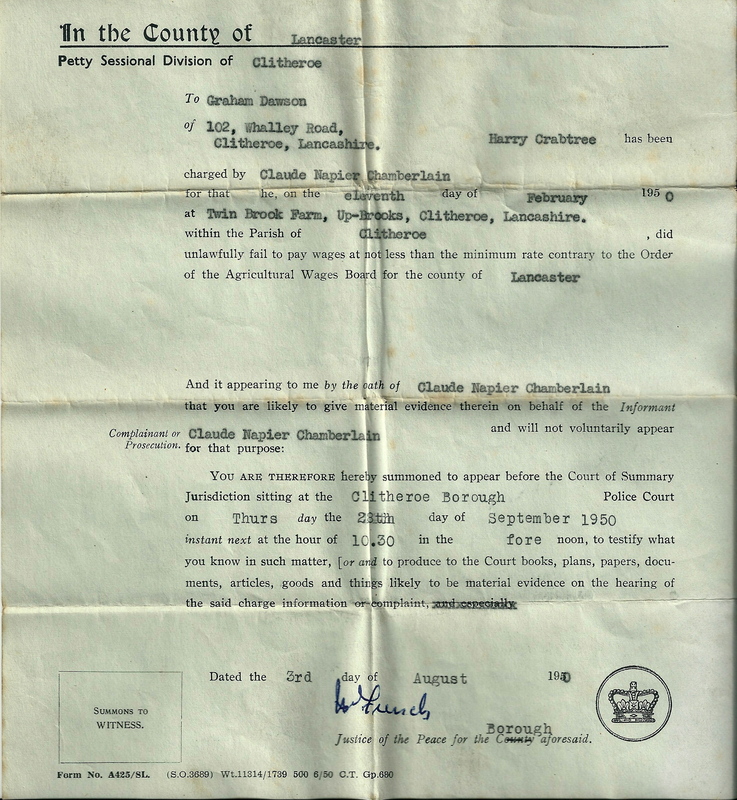 I don’t know whether my dad was a willing participant in the proceedings or not as he was served with a witness summons (below) on 3rd August 1950. According to the newspaper report my dad worked for Mr Crabtree from October 1947 until April 1950 and wasn’t paid the correct rate of pay for overtime. The Ministry of Agriculture said “the claim could extend back for a period of two years but the prosecution was brought in respect of the failure to comply with the Orders for a week in February and one in March this year”. Mr Crabtree pleaded guilty to “technical offences”. His solicitor said that “the pamphlets issued by the Ministry were very complicated” although he “ thought the principle for payment for overtime was generally understood by members of the farming community”. He went on to say that “a farmers job is to milk and look after his cattle and not to read pamphlets issued by the Ministry”. He also suggested that it was difficult for farmers :to keep check of times of starting, finishing and dinner hours etc.”. It seems as though an agreement had been reached between the parties concerned and the The Magistrates made an order for repayment of £53 10s. 4d. So, willing participant or not, it looks like a good outcome for my dad. I’m not too sure what Mr Crabtree made of it – but I think I can guess. 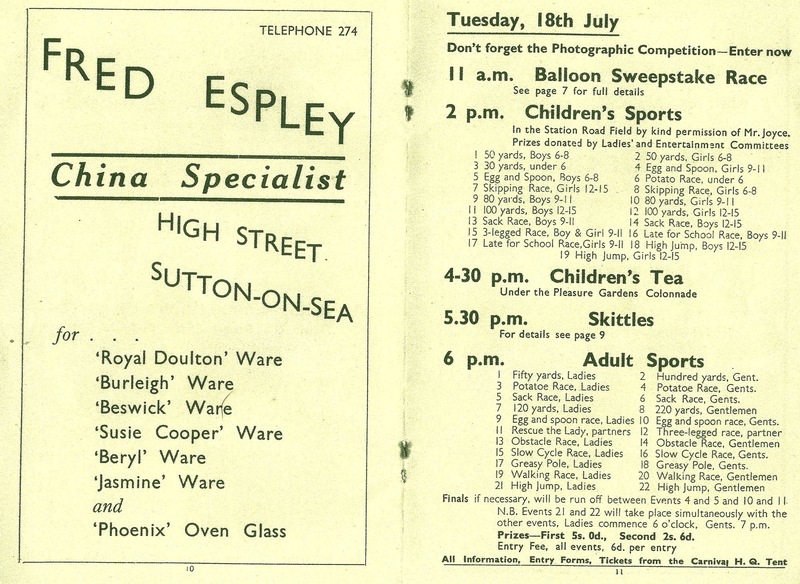 Daniel Owen Espley is my wife’s grandfather. He was born on 14 March 1886 in Biddulph, Staffordshire. He was always known as Owen to the family. At some point Owen and his wife Betsy moved from Staffordshire to Mablethorpe in Lincolnshire. They opened a glass and china shop in the town possibly because Betsy had previously worked at the Shelley pottery factory in Staffordshire. As far as we know there was no other connection to that line of business. Owen eventually stood as a local independent councillor on Mablethorpe and Sutton Urban District Council. Please do me the favour of reading this address carefully, for you are approaching one of the most critical elections ever known in our town. 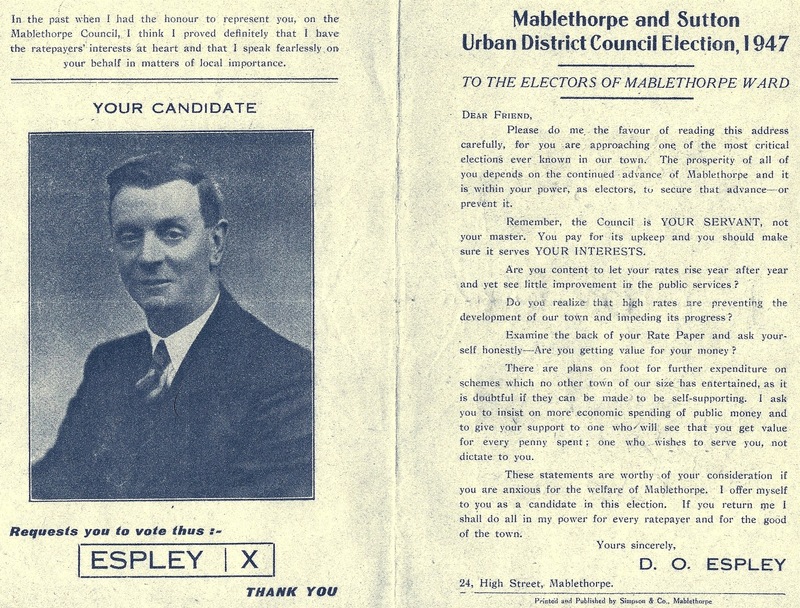 The prosperity of all of you depends on the continued advance of Mablethorpe and it is within your power, as electors, to secure that advance – or prevent it. Remember, the Council is YOUR SERVANT, not your master. You pay for its upkeep and you should make sure it serves YOUR INTERESTS. Are you content to let your rates rise year after year and yet see little improvement in the public services? Do you realise that high rates are preventing the development of our town and impeding its progress? Examine the back of your Rate Paper and ask yourself honestly – are you getting value for your money? There are plans on foot for further expenditure on schemes which no other town of our size has entertained, as it is doubtful if they can be made to be self-supporting. I ask you to insist on more economic spending of public money and to give your support to one who will see that you get value for every penny spent; one who wishes to serve you, not dictate to you. These statements are worthy of your consideration if you are anxious for the welfare of Mablethorpe. I offer myself to you as a candidate in this election. If you return me I shall do all in my power for every ratepayer and for the good of the town. Today I want to tell you about my 4xgreat grandfather John Dawson. He is the earliest Dawson relation I have found in Cowling, West Yorkshire. For a long time I believed that John was a local chap although I hadn’t been able to find any clues as to his birth or his parents. More recently I have discovered via other researchers that it is highly likely that John actually comes from Clitheroe in Lancashire. Now for someone who believed that his roots were firmly set in Yorkshire the idea that I might orginate from Lancashire has been hard to take. But it may well be an opportunity for a later post when I have looked at the information available for the Dawson’s of Clitheroe in the future. But for now I want to concentrate on John’s life in Cowling. According to the IGI John Dawson married Ann Watson on 3rd May 1792 in Kildwick, West Yorkshire. I have an IGI burial record for John dated 16th October 1832 at Kildwick Parish Church. On the 1841 census I found Ann indexed under the name of Davson. The IGI shows her burial also at Kildwick Parish Church on 9th July 1846. John and Ann had nine children – Priscilla (1793); John (1795); James (1797); Thomas (1799); Alice (c1802); Elizabeth (c1804); William (c1806); Watson (c1808) and John (c1812). The first John born on 31st May 1795 died the following year in July 1796. The village of Cowling has had a number of textile mills over the years and this could be the subject of a post all on it’s own. However I want to talk about Ickornshaw Mill which was built in 1791. There is a very interesting story about John Dawson in connection with this mill. The following extract is from a book called Cowling A Moorland Parish written by the Cowling Local History Society and published in 1980. Ickornshaw Mill is the oldest mill still in use in Cowling, being built in 1791, on land bought by John Dehane of Kildwick from Hugh Smith, a yeoman farmer of Cowling who owned Upper Summer House Farm. The mill was built in three months and a waterwheel was installed by Mr Dawson of Clitheroe who lodged at the public house in Ickornshaw. 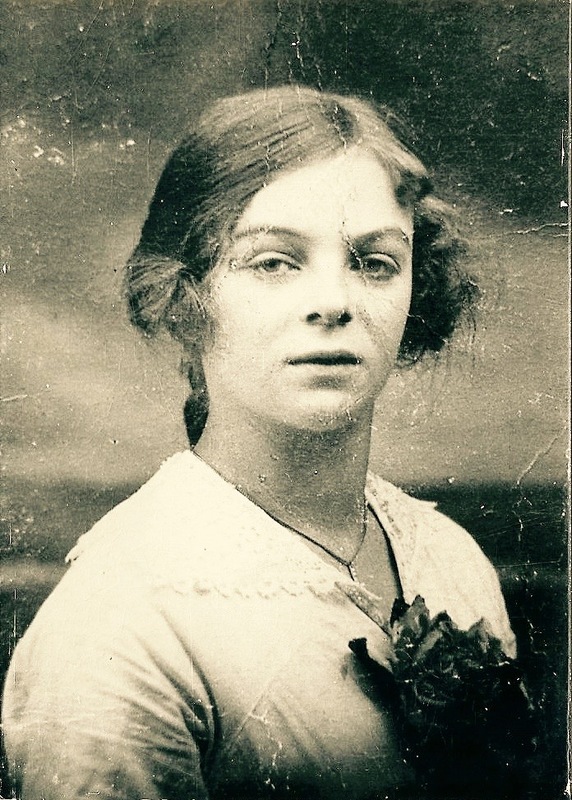 Here he fell in love with the barmaid whom he married, but as his family disinherited him, he stayed on in Cowling and acted as “engine tenter”, blacksmith and mill mechanic. His son and grandson followed in his footsteps tending the wheel for one hundred and ten years. The wheel was capable of 50-60 horse power, running 150-180 looms with the engine completely stopped. In 1910 the wheel was overhauled, after 119 years free of any major repairs, a fine testimony to the quality and craftmannship. The mill whistle had to be blown at 5.30am to rouse the workers, and as the engine tenter thought this was an unearthly hour to get up, Mr Dawson having an inventive mind, built a contraption from old clocks, picking bands, a weaver’s beam, pieces of wire and a few loom weights which would perform the duty for him whilst he slumbered a little longer. He tried out his invention several times, but always being on hand in case it failed, and at last decided that there was no point in him having his “brainchild” working and being present himself. So, the following morning he decided to listen to his invention operating on its own. It started off at the correct time, but Mr Dawson quickly realised that it was not going to stop. However, it did bring the hands to work earlier that morning, anxious to see what all the noise was about. The contraption worked well for some considerable time, and was only terminated when Messrs. John Binns and Son took over the responsibility of rousing the neighbourhood with their own much louder whistle. I really like this story and have a great fondness for John Dawson. As mentioned in the extract above his son, John, took over from him. In the 1851 census this John Dawson’s occupation is shown as “mechanic”. In 1861 and 1871 he is described as “engine tenter”. This John Dawson’s son…..also called John, took over from his father and continued to look after the wheel and the engine. I have found him on the 1871, 1881 and 1891 census records described as “engine tenter” – but so far I haven’t been able to find him in 1901. In 1881 and 1891 this John was living in Nelson and Barrowford respectively – about nine miles from Cowling – so he had a bit of journey in those days to get to the mill. I am not the only Dawson to have found the story and the history really interesting. Here is a letter from Jas Dawson dated 3rd December 1937 published in the Craven Herald & Pioneer and reproduced here by Cowling Moonrakers. Jas seems to be the son of the last John Dawson to look after the wheel and engine. The letter was written shortly after the waterwheel had been dismanted and gives more history and information. Religion in the village of Cowling, West Yorkshire is likely to be the subject of a future post. However it provides me with something to write about for Amanuensis Monday this week. My Dawson ancestry is firmly rooted in Cowling. My 2xgreat grandfather, John Dawson married Ellen Gawthrop on 8th April 1844 in the Parish Church of Kildwick. So I am connected to John Gawthrop by marriage. He is my 1st cousin 3x removed. John was born c1853 and he married Elizabeth Thornton in 1890. As far as I have been able to determine they had at least two children – Elsie and John. On the 1871 census John was living with his parents and working as a weaver. In 1881 he was still with his parents but his occupation had changed to a local mission preacher. By 1891 John was away doing mission work and he and Elizabeth are shown as visitors at an address in Gravenhurst, Bedfordshire. His occupation is shown as Wesleyan Minister. In 1901 John, Elizabeth and their two children were living in Kirkby Stephen, Cumberland. I guess it’s a sign of how much they moved about the country that Elsie was born c1892 in Northampton and John was born c1896 in Foleshill, Warwickshire. OK, that just about sets the scene! “a typical product of the revivalist era and whose unorthodox methods and powerful personality made him one of the most successful mission workers of his day. He gained a high place in the Wesleyan ministry, conducting several large missions in various cities and serving as pastor of important churches throughout the country”. This article from the Cumberland & Westmorland Herald of November 2000 includes a look back to 100 years ago and tells the story of John speaking in Kirkby Stephen and complaining that “there were no young men in the Wesleyan societies. At Dent Head, Blencarn and Milburn, where he had just held missions, there was not a single young man and scarcely a young woman to be seen. It was a shame that the devil should have the cream of the young people”. I get the impression that John was a bit of firebrand and I would love to be able to get copies of some of his sermons if they still exist. Writing this post has motivated me to see if the Methodist Church have any records remaining of John Gawthrop and his work. So I may be talking about him again if I am successful.